This new study, co-authored by UMCure 2020 scientists and physicians, demonstrated the feasibility of rapidly conducing clinical trials in Uveal Melanoma by assessing the efficacy and safety of Selumetinib, an inhibitor of some of the molecular pathways activated by the GNAQ or GNA11 mutations in Uveal Melanoma (which had also been shown to promote programmed cell-death, or apoptosis, in vivo), in patients previously untreated with systemic therapy for metastatic uveal melanoma. Although Selumetinib plus Dacarbazine was not associated with a significant improvement in progression-free survival (PFS) or objective response rate (ORR) for patients with metastatic Uveal Melanoma compared with placebo plus Dacarbazine, a trial evaluating Selumetinib plus Paclitaxel for metastatic Uveal Melanoma is underway (EudraCT: 2014-004437-22). Uveal melanoma is the most common primary intraocular malignancy in adults with no effective systemic treatment option in the metastatic setting. Selumetinib (AZD6244, ARRY-142886) is an oral, potent, and selective MEK1/2 inhibitor with a short half-life, which demonstrated single-agent activity in patients with metastatic uveal melanoma in a randomized phase II trial. The Selumetinib (AZD6244: ARRY-142886) (Hyd-Sulfate) in Metastatic Uveal Melanoma (SUMIT) study was a phase III, double-blind trial (ClinicalTrial.govidentifier: NCT01974752) in which patients with metastatic uveal melanoma and no prior systemic therapy were randomly assigned (3:1) to selumetinib (75 mg twice daily) plus dacarbazine (1,000 mg/m2 intravenously on day 1 of every 21-day cycle) or placebo plus dacarbazine. The primary end point was progression-free survival (PFS) by blinded independent central radiologic review. Secondary end points included overall survival and objective response rate. A total of 129 patients were randomly assigned to receive selumetinib plus dacarbazine (n = 97) or placebo plus dacarbazine (n = 32). 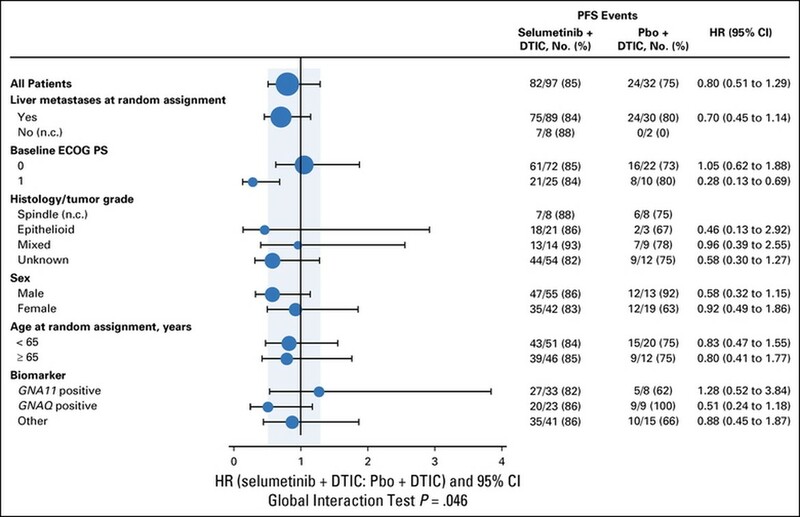 In the selumetinib plus dacarbazine group, 82 patients (85%) experienced a PFS event, compared with 24 (75%) in the placebo plus dacarbazine group (median, 2.8 v 1.8 months); the hazard ratio for PFS was 0.78 (95% CI, 0.48 to 1.27; two-sided P = .32). The objective response rate was 3% with selumetinib plus dacarbazine and 0% with placebo plus dacarbazine (two-sided P = .36). At 37% maturity (n = 48 deaths), analysis of overall survival gave a hazard ratio of 0.75 (95% CI, 0.39 to 1.46; two-sided P = .40). The most frequently reported adverse events (selumetinib plus dacarbazine v placebo plus dacarbazine) were nausea (62% v 19%), rash (57% v 6%), fatigue (44% v 47%), diarrhea (44% v 22%), and peripheral edema (43% v 6%). You may find the original paper in our list of publications.